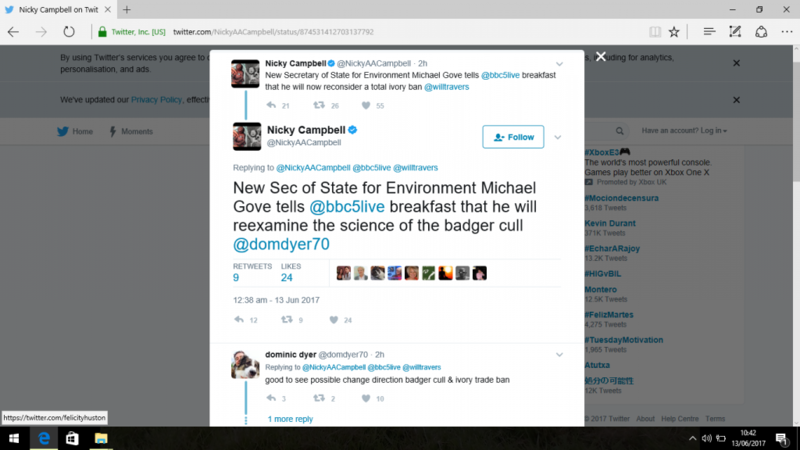 The licence specifies the start date of the cull and the minimum and maximum numbers of badgers that may be killed in the stated year. There is no mention of an end date although there is a long area of redacted (blanked out) text which may include such information. 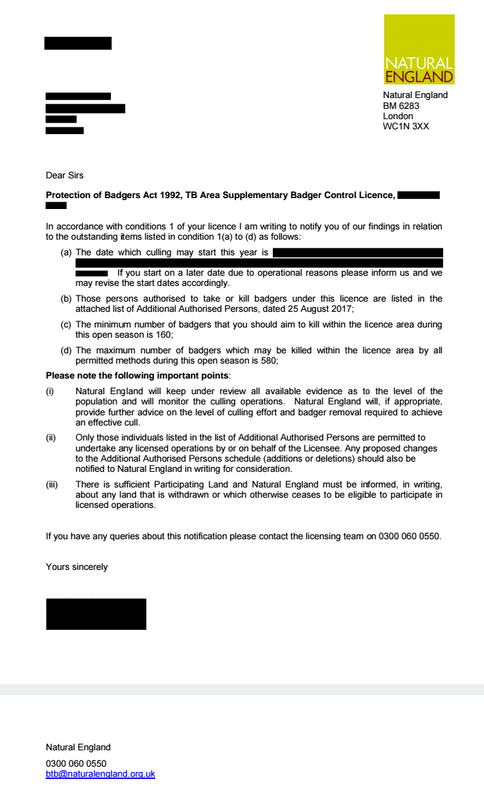 However, the licence conditions state that “no less than the specified minimum” must be killed during the cull period and state that the cull will continue until the specified maximum number has been reached or Natural England tells contractors to stop (for example if culling has gone on until the end of the open season). The open season the dates between which badgers can be killed under licence. These are not the start and end dates of the culling period. Last week we received a tip-off from a credible source that land owned by Prince Charles (Duchy of Cornwall) in Gloucestershire is signed up to the Wiltshire cull. The information received was that it’s “not just Highgrove” meaning that smaller, fragmented bits of land with tenant farmers may also be included. If that land was signed up, what other areas near the Glos-Wilts border would also be involved? 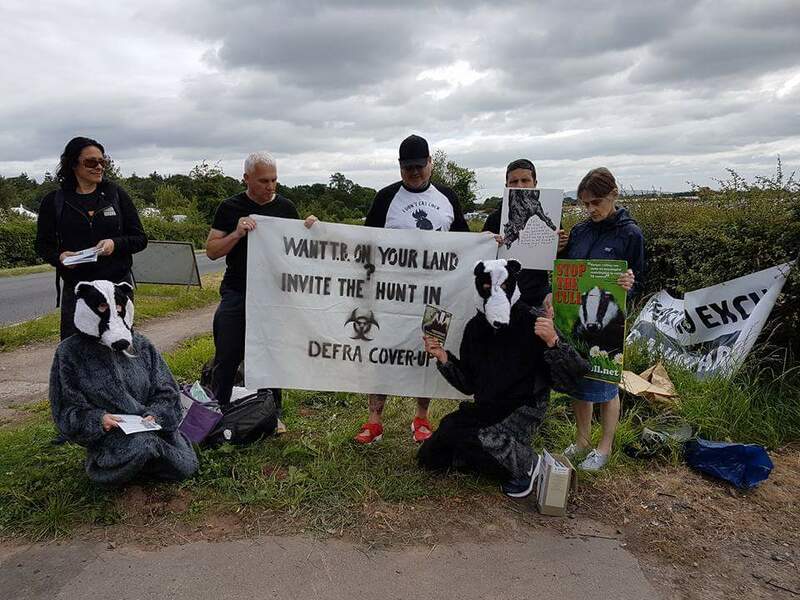 With experienced people living locally and having already started to sett-survey the southern areas of Gloucestershire at the end of last year’s cull in anticipation of future zones, we were straight on coordinating the area. Very soon reports were coming in that culling activity was being found South West of Tetbury, outside of the area initially thought to be the Wilts zone (including on land owned by Duchy of Cornwall). Activity was then found North East of Tetbury, again including land owned by Duchy of Cornwall. The licence for the old Gloucestershire pilot zone was issued on the 25th August 2017 and runs until 31st January 2022. There is no specific mention of how long culling periods WILL be – caging cannot go on after the start of December and ‘free shooting’ must end by the end of January… we’ll keep you updated as and when we hear more. The minimum target is 160 and the maximum is 580. So game on. Camp is up and running and it’s business as usual. All zones need help checking for traps and peanuts. We have just spoken to BBC radio Gloucestershire to be broadcast in the morning. We expect the North Cotswold zone licence to be issued shortly. Cages and bait points will be going out in the next few weeks. The more people on the ground, the more badgers we protect. We are out every day in Gloucestershire and can meet up with anyone on most days who want to learn more – we won’t be putting up all our ‘daily reports’ on this site, though main news stories and urgent calls to action will be posted. As for ‘everyday’ sett-checking and so on, please keep up-to-date on our facebook page! 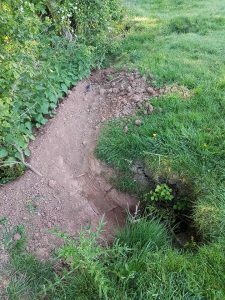 … and for more information about sett-surveying and badgers, we will also have a page up with tips and information, so watch this space! There is another public consultation coming up and we urgently need people within the affected areas to write in with regards to concerns for safety. Last year we had a shooter, Mason Burgess, take a shot at a badger in a field near to a school’s floodlit pitch with a football match going on on it in Newent. Over the years there have been numerous breaches of cull licence and guidelines and we’ve had to deal with numerous incidents of unsafe pre-baiting locations and even shots being taken towards footpaths and roads. and please share the consultation so others can also do so! 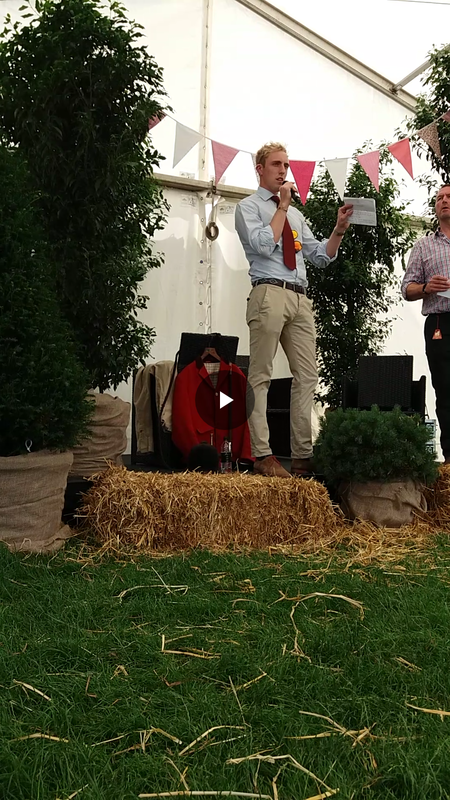 We’ve had a couple of really good days at the Royal Three Counties Show in Malvern this weekend, starting with a demo outside on Friday, before going inside the show yesterday. Between checking out some of the hunt staff and hounds at the hound show (confirming what we had heard about Simon French who was huntsman at the CVFH becoming whipper-in for the Croome and West Warwickshire) and attending a talk by CVFH Master, Ed Burrows, we had some good chats with people at the NFU and CA stands, a Hartpury College lecturer and representatives of other organisations including the Aberdeen Angus society. We also met a lovely woman from the WI who told us about various campaigns they support (protecting honey bees, supporting those with Alzheimer’s, raising awareness about food poverty and so on). A lot of our information on TB given out and good points raised on all sides, contact details swapped and interesting ideas in the pipeline. Video of Ed Burrows’ talk will go up soon, so watch this space! Scientific re-assessment of the cull? Time for the cull to be assessed again re the science? Time to examine closely how fox hunts may spread BTB? The meeting and sett surveying day in the Forest of Dean went well today. Much of the area is known by locals and setts being monitored here, South Gloucestershire and in the 2 Gloucestershire cull zones. 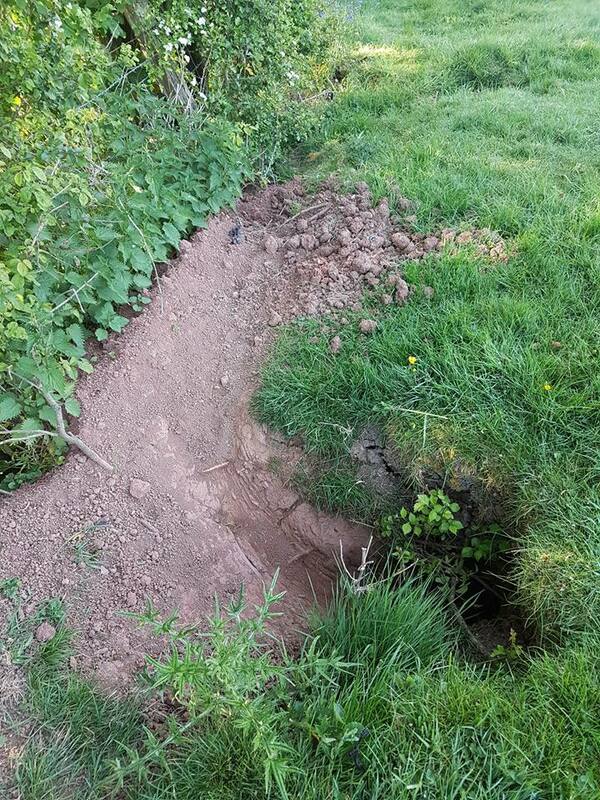 With sett surveying it is easy to be overawed by the immensity of the task however as with all large tasks it can be reduced to bite size chunks. 10 square miles to cover is a lot but let us say someone can spare 4 hours every 2 weeks and can do say 1 sq mile…within 6 months the job is done, within a year 20 sq miles, within 2 years 40 sq miles, all surveyed by one person. This time 4 years ago Reel News started to join us in the cull zones and on the streets to document what we were up to, and what we were facing, in trying to help badgers. With roll-out continuing to new areas and tactics changing to reflect this, with groups and individuals starting to do more work in their local areas against wider persecution of wildlife, it seems a good time to remember how it all kicked off in 2013 and how much has changed. Support our continued work if you can!